Some of you may have already seen the following in one of the woodworking forums. I wanted to document it here, however, to consolidate my work in this blog. This is just one case of asymmetric half-blind dovetails: This example is for inset drawers, in which the width height of the front board is greater than the side and back boards. Asymmetric dovetails in my example means simply that the width of the drawer front is a different width than the width of the sides and back. In addition, the top edge of the front is even with the drawer sides, and the bottom edge of the drawer front extends below the drawer box. In this case the bottom edge acts as a stop against the web frame when closing the drawer. 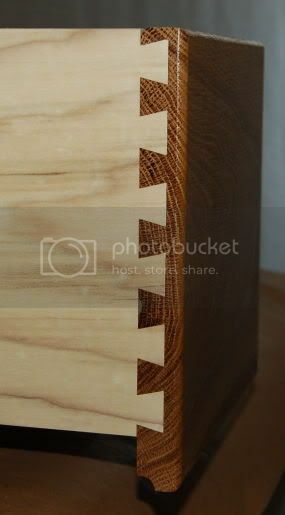 There are many types of asymmetric dovetails; this case is limited to drawer fronts, although it may apply to other cases. 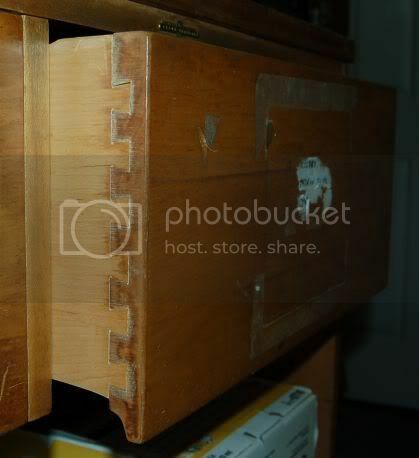 As the photo above shows, the pin at the top of the drawer front in very thick; in fact, it is much thicker than current practice. Today, we aim for a narrow, half-pin at the top and bottom. THIS detail is what made the layout more difficult than I wanted to address. 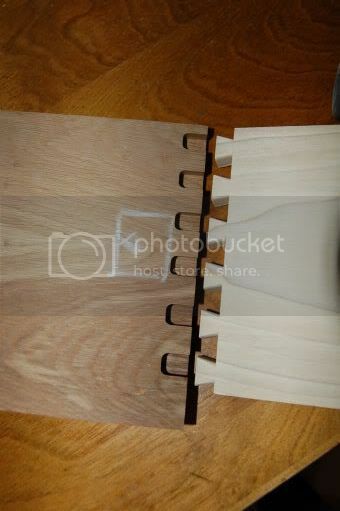 >In the case of a drop-front drawer, the drawer front’s bottom half-pin is much wider that the top half-pin. In this case, one would use the right-hand side of the D4 dovetail jig, to transfer the layout (Figure 13-16 of the D4 User Guide). I did not want to do this, because I wanted the procedure to be as simple as possible. How is THAT for lazy? I can cut a spacer much quicker than I can transfer the layout to the right-hand side of the D4. 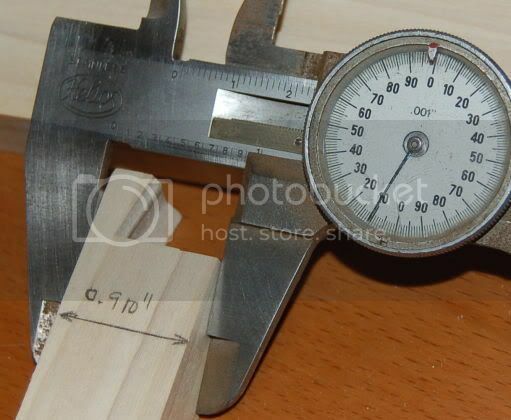 In my example, the difference in board widths was 0.910″, easy enough to cut on the table saw. The following is the finished half-blind dovetail board (these make the sides) in one drawer front, as it sat on the turntable in the finishing room. It looks like a good fit! 1. Always work with test boards, to ensure you are happy with the layout and you get the fit just right. 3. ALWAYS mark the IN surfaces of the side boards (TAILS in my example for these half-blind joints); ALWAYS mark the OUT surfaces of the BACK boards (PINS in my example). Doing this ensures that, if you have to walk away from the project for any length of time, you will still know which surface must face out. 4. AND always ensure that the marked surfaces face OUT in the jig. 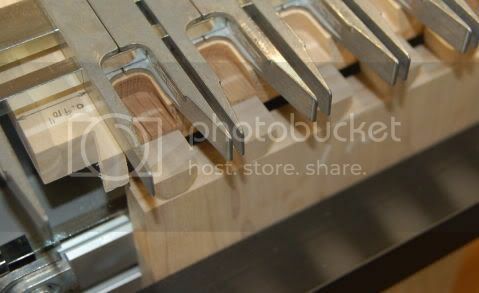 This way you always make sure that you are cutting from the the proper side of the boards, which is CRITICAL when cutting dovetails. I hope this helps you some day . Enjoy!